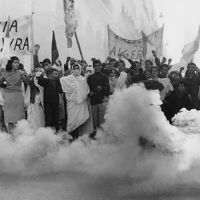 Director/co-writer Gillo Pontecorvo’s The Battle of Algiers was banned in France until the mid-1970s. Some civil war must have raged within director/co-writer Gillo Pontecorvo, between the revolutionary who chooses sides in this story of resistance, and the poet who has enough integrity not to romanticize the side he’s chosen. So uncompromising that it became a training film for all sides of guerrilla warfare (including U.S. troops in Iraq four decades after its release) and shot with the brutal dispassion of the documentarian that the Italian filmmaker was (with Ennio Morricone’s most austere score), this was a shock to American radicals in its decade including the Black Panthers, given its cool survey of liberation’s price and the cumulative cost to the human spirit no matter whose side is right or winning—insurrectionist bombs blowing up cafes full of women and young people, and offering no excuses for it. The picture’s single professional actor, Jean Martin, plays the leader of paratroopers quelling the rebellion in the French colony of Algeria, and his fascism is shot through with the steely charisma that make totalitarianism so irresistible, barely a drawl away from some of the cavalry leaders in John Ford’s horse-soldier epics. The Battle of Algiers was banned in France until the mid-1970s when it finally was released in a censored version, perhaps because that most cinema-conscious of countries could no longer stand being so irrelevant as to not have seen it.